In Flower Garden you can look at the flowers from different angles and viewpoints. 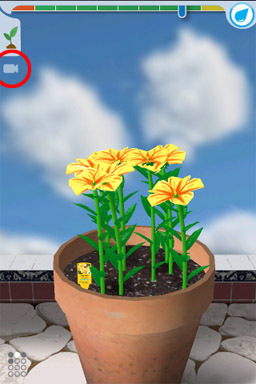 Touch the screen with two fingers and slide them up or down to look at the flowers from higher or lower. Pinch the screen in or out to zoom in closer or further away. Whenever you change the default viewpoint, a camera button appears on the left of the screen. Tap that button to restore the default viewpoint. You can also look at the pot from different angles by rotating it in place. Touch the pot with one finger to slide it left or right.